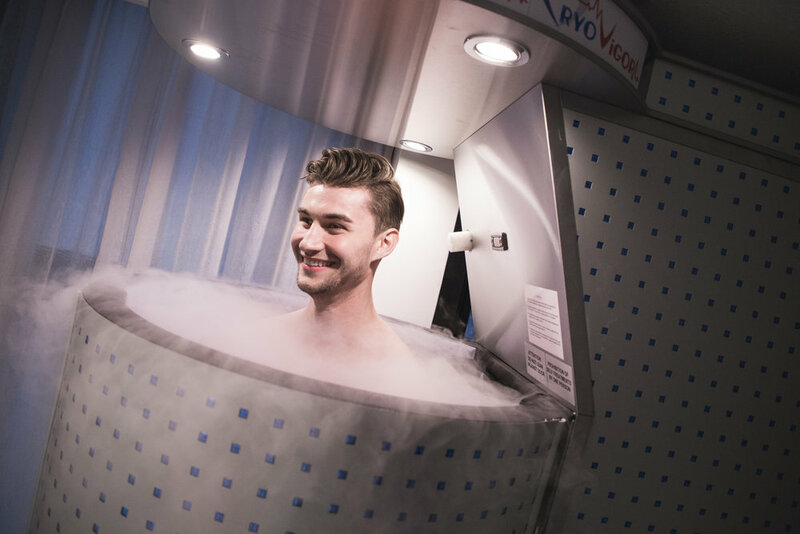 Our trained technicians of Cryotherapy in NYC will be there every step of the way to ensure your comfort and safety. For just 3 minutes hyper cold air circulates around your body. Your skins surface temperature drops to 40℉ to 50℉ triggering skin sensors to send blood to your core. Your internal cycle then works to remove toxins and inflammatory properties from the blood while enriching it with oxygen, nutrients and enzymes. How does all this happen? When you first enter the chamber at -200F to -256F, the blood vessels constrict forcing all the blood to the core to protect vital organs. Here is where your body works to remove toxins and inflammatory properties in the blood while enriching your blood with oxygen. This oxygen enriched blood bolsters organs and when you step out of the Cryosauna the blood is released from the “internal cycle” and flows back out to your extremities bringing all the healing properties with it. Over the next 6-8 hours your body will continue to recover and restore to a better self. Most doctors will tell you, chronic inflammation is a major cause of pain and disease. Decreasing inflammation in the body will help fight infection, heart disease, cancer, arthritis and visible signs of aging.